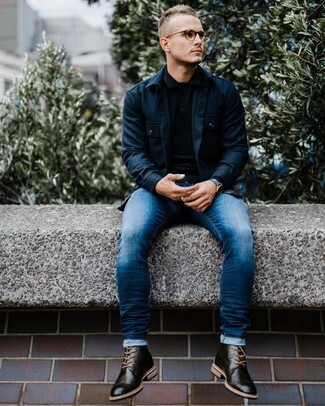 To put together a casual look with a modern finish, you can easily wear a navy shirt jacket and black jeans. To give your overall outfit a classier finish, finish off with dark brown leather derby shoes. 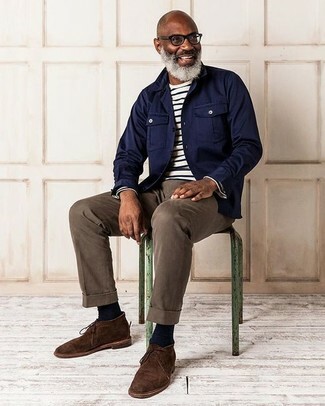 A navy shirt jacket and navy jeans are the kind of a winning off-duty combination that you need when you have no time to dress up. If you're on the hunt for a casual yet on-trend ensemble, consider wearing a Billabong dekker jacket and navy jeans. Both pieces are totally comfortable and will look great paired together. For something more on the daring side to finish off this ensemble, make white leather low top sneakers your footwear choice. 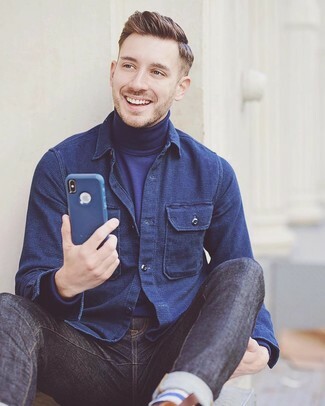 You're looking at the definitive proof that a Billabong Dekker Jacket and blue skinny jeans are amazing when teamed together in a casual ensemble. If you need to instantly class up this ensemble with one piece, go for black leather brogue boots. 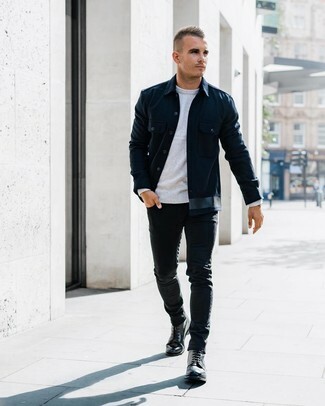 You're looking at the hard proof that a navy shirt jacket and black skinny jeans look amazing when teamed together in a casual look. Add an elegant twist to this ensemble by rocking a pair of black leather casual boots. 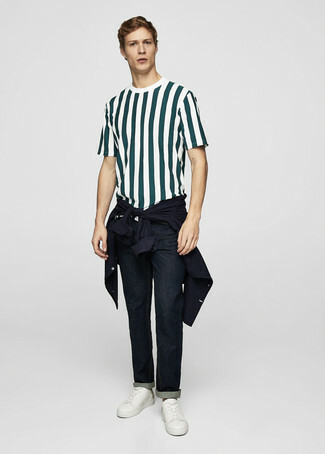 If you're hunting for a casual yet stylish ensemble, marry a navy shirt jacket with blue vertical striped jeans. Both pieces are totally comfortable and will look great paired together. So as you can see, looking seriously stylish doesn't take that much time. 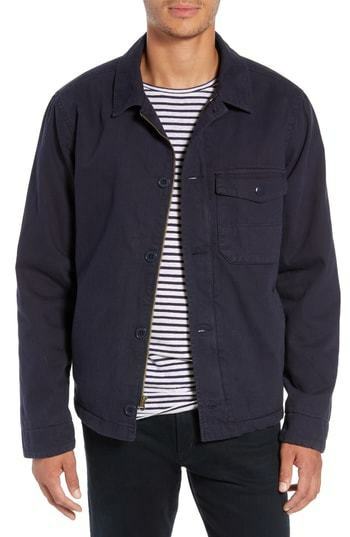 Just team a Billabong dekker jacket from Nordstrom with brown chinos and you'll look smart. 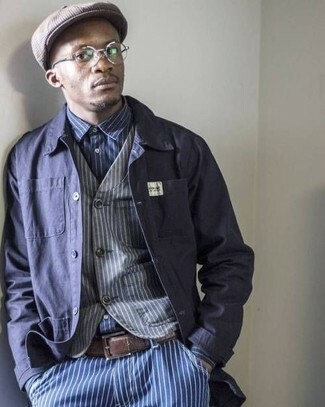 When it comes to shoes, this outfit is round off nicely with dark brown suede desert boots. This pairing of a navy shirt jacket and olive dress pants is a real life saver when you need to look truly dapper. 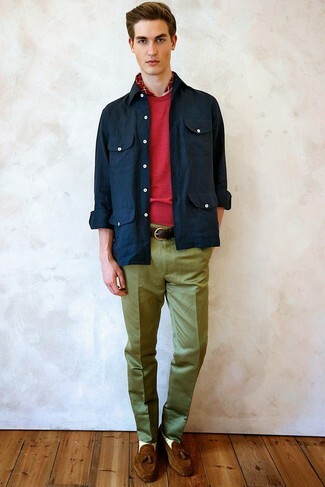 This look is rounded off perfectly with a pair of brown suede tassel loafers.